I grew up in Ireland, where even in the heat of summer, the sea is still a little chilly. And, in winter, it’s downright cold. I’m much happier with warm water, where you don’t need a wetsuit to go for a swim. And, I prefer beaches where you don’t get hassled. I don’t want someone trying to sell me cheap souvenirs or a tacky t-shirt every few minutes. I’d much rather read and think and relax uninterrupted. So, here’s my top three. And, my take on whether they’d make good locations for a vacation home. I’m not convinced by his theory. But you definitely feel amazingly recharged after a day relaxing on this beach. Perfect sand, perfect water…Doctor’s Cave Beach is an Instagram dream. Visitors pay $6 for access. There are changing rooms and showers on site. You can rent chairs, umbrellas, and Li-los. And the club’s restaurant and bar make it easy to get snacks, lunch, or fancy cocktails. This beach was a lucky find some years back. A driver had picked me up very early in the morning and taken me from one property to another around the Samana peninsula. He was (like most Dominicans I’ve met) very friendly and chatty. He was also on a mission to prove that his home island could stand up there with the best in the world on all fronts (food, music, sport, and beaches). On the way back to my base in the town of Las Terrenas, he suggested a detour. To show me the best beach in the world. We set off down a rutted, bumpy track. “It will be worth it,” the driver grinned, “just you wait.” He was right. 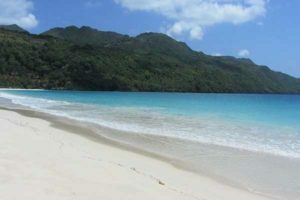 Playa Rincon is a gorgeous curve of soft, fine sand. The west side of the bay has a couple of restaurants and beach loungers. The setting is wild, natural, and unspoiled, with palm trees covering the green hills around the bay. The biggest surprise was the fact that this incredible beach was empty: we had it all to ourselves. Escape from it all at Playa Rincon, a hidden getaway in the Dominican Republic. You can buy an in-town condo in Las Terrenas for as little as $150,000. And your second home can earn good rental income. There’s a shortage of accommodation at peak times (from November through to Easter) and owners can make double-digit rental returns. X’Cacel Beach, Riviera Maya, Mexico. This is another beach that I discovered on a scouting trip through a local contact. It’s pristine and should stay that way thanks to some very strict rules. The beach is an important turtle nesting site. You pass through a checkpoint on the way in where you are asked to make a small donation to fund beach cleaning and conservation. Then you park your car and stroll up to this unspoiled beach. 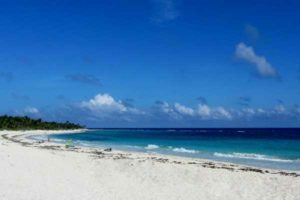 This turtle nesting beach boasts pristine sand and a little freshwater cenote. Just beside the beach there’s a natural freshwater sinkhole (a cenote). The water in the cenote is cool and refreshing, a lovely contrast to the warm Caribbean Sea. 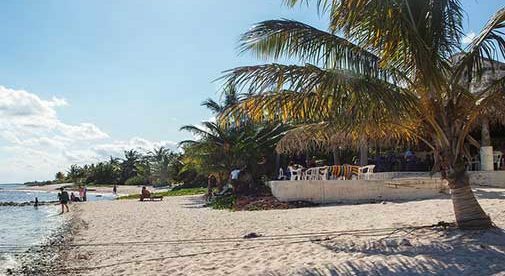 This quiet beach is tucked away between the towns of Playa del Carmen and Tulum. This stretch of coast is home to dozens of spectacular beaches, so keep your camera at the ready. And it’s a coast that’s an excellent location for a second home. 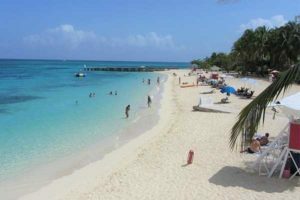 It’s probably the easiest Caribbean destination to get to—the international airport has flight connections across North and South America and Europe. Second homes (especially off-beach condos) are still very affordable with pricing from as low as $200,000 for a two-bedroom condo. And, this is a place where you can make good rental income from a second home…generating income of $35,000 a year in Tulum and as much as $55,000 a year in Playa from a well-located two-bedroom condo.